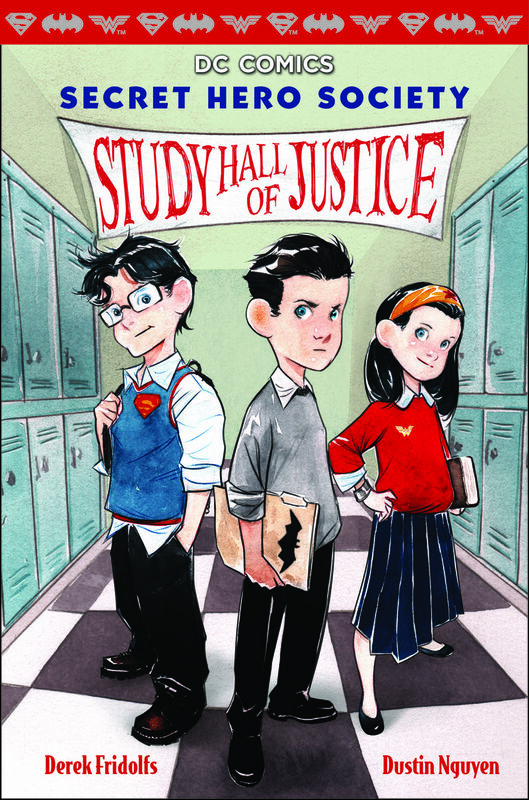 Li’l Gotham, the all-ages take on DC Comics’ superheroes, has earned a loyal and passionate following, and now creators Derek Fridolfs and Dustin Nguyen have reunited in a collaboration between DC Comics and Scholastic Books to bring you Secret Hero Society: Study Hall of Justice. Secret Hero Society: Study Hall of Justice finds a young Bruce Wayne enrolled at Ducard Academy, a school with a musclebound bully named Bane, a joker gang and Hugo Strange on staff, among other problems. Bruce joins forces with fellow students Clark and Diana to investigate the school’s sinister secrets. The duo had been working together for years, but are perhaps best known for their work apart. Nguyen has had notable runs as the artist of various Batman comics and is the co-creator of the current Image Comics hit Descender along with writer Jeff Lemire. In addition to his inking work, Fridolfs has written a wide range of comics from Batman: Arkham City to Dexter’s Laboratory and has carved out a niche writing all-ages comics for a variety of companies in recent years. With the first book in the series on sale now, CBR News had a chance to speak with Nguyen and Fridolfs about their latest collaboration, how it was inspired in part by Li’l Gotham but soon took on a life of its own and what their goals were for the all-ages story. CBR News: Just so everyone is on the same page, what is Secret Hero Society: Study Hall of Justice? Derek Fridolfs: It’s an all-ages title. It’s a detective story about Bruce and Clark and Diana when they’re all going to a school together and gives us the chance to reintroduce the characters in a younger setting than what we’re probably used to. CBR: As many readers know, you two have been making Li’l Gotham, but how did this book come about? Fridolfs: It’s a new process for us because it’s DC-related but it’s not through normal channels. We’re going through the bookstore market, the children’s book market. There’s lots of levels to get approvals but other than that we have a wide range of freedom. Nguyen: We’re shooting for a different audience than we’re used to so it’s really exciting for both of us. CBR: What does making a DC-related book aimed at kids mean? Fridolfs: We can get away with a little more violence in comics and this is a much younger audience than that so it’s more cartoon violence. The thing with comics is that every time you introduce a character in Batman comics, ninety percent of the time readers already know the history of that character. In this we’re introducing the characters to kids who might not have read about these characters yet or might not know about them yet. It’s a little more light hearted. CBR: This is book length, the pages are smaller in size, different paper and there’s no color. Dustin, other than the fact that you’ve colored much of your recent work, have these differences changed how you work? Nguyen: Definitely. The drawing took a while because for this one I drew at scale to print because I wanted the pencil strokes and the brush strokes to show up. I’m using different paper because it’s black and white. I’m working with bristol paper rather than watercolor paper so when I do the washes so it looks a little smoother. Derek and I talked about this when we first started. When it’s printed it’s close to half the size of a normal comic book. On pages where we do have panels we have to make room for a lot of word balloons so we have a lot less room to work with. Fridolfs: It’s a learning process on my end because writing some of the sequential pages for Dustin to draw, working with that small space you have to limit the panel count. I know for the next book we’ll probably keep it a lot smaller panel wise so that everything doesn’t get so crammed in there because it’s smaller. CBR: Was drawing the book at print-size important so you could control how the finished product looked once it was out of your hands? Nguyen: I’m pretty picky about how things get printed, everything down to seeing the grain of the paper. When we work at 11″ x 17″ sometimes some of the greatest inkers out there do amazing work and then it gets scanned down and you lose a lot of the hard work they put in there and that’s a shame. Obviously you can’t walk around with an 11″ x 17″ comic book. With this, it’s something I can control. On Li’l Gotham I worked at 9″ x 14″ so you can see some of the washes come through they and don’t get lost in the printing. With this one because it’s black and white it’s even easier to control what gets printed and how it gets printed. I worked to scale and did a lot of the cleanup on the computer, but everything was traditional drawing because I like doing stuff by hand. CBR: You mentioned that DC had the core characters in place when they approached you. Did they steer you away from Li’l Gotham or was that a conscious choice on your part? Fridolfs: Originally they showed us some of the Jedi Academy books, all-ages material that Scholastic was putting out, and they wanted something similar to that. It was a matter of coming up with different formats to tell the story. They call them artifacts. You put printouts and calendar events and texting and different things like that to show the process of these kids going through the school year together and all the different sort of activities and adventures they get into. That was the most creative part of putting this together, just trying to make every page count and make every page different and interesting. It’s a lot of fun. It’s different and I think it turned out really well. CBR: The fact that much of the story is told through journal entires, text messages and report cards I would imagine means you have to write it differently than traditional comics. What was that process like? Fridolfs: It’s a different mindset you get into. You have to switch out of thinking visually and think how to tell these stories with a lot more work than I’m used to. With something like this you get a chance to get into the heads of the characters more, you get to hear their voices. You’re not limited to the page count and panel count that you get in a normal comic so you get these journal entries by the characters and get inside their heads that way. It was daunting but it was also freeing at the same time getting a chance to work out how these characters think and talk. A lot of it is coming up with different ways to present situations. It would be very easy to have nothing but computer journal entries and that would be very boring read so you try to think of different angles to present the story and also make it fun for Dustin to draw and come up with something visually that will be interesting to the reader and to the artist. CBR: The two of you started in comics together, more or less. Around 2000, Dustin, you were pencilling Jet and Gen-Active, and Derek you were inking him. Fridolfs: It’s only gone downhill since. CBR: When did you two start writing together? Fridolfs: We did some Batman stories. CBR: You’ve both done a lot of Batman stories over the years. What is it that keeps you coming back to the character? Fridolfs: I grew up watching the animated series so I always use that as my template as far as what I liked about the character. The character is visually cool. He has the best rogues gallery out there. I try to write interesting stories that I would want to read, whether I was a kid or an adult. Growing up, the comics that I enjoyed were ones that I think weren’t written for just one age, anyone could pick them up. I’ve always loved Batman. Nguyen: Same here. I like Batman for all the same reasons — great rogues gallery, he’s just really cool looking, he’s easy to draw. I mean ninety percent of him is covered in darkness and capes so you don’t have to really know how to draw anything. [Laughs] He’s a great character, has a great back story. I was never really a superhero person, but Batman was always a grounded character I liked. He’s not even my favorite superhero, my favorite hero is actually Superman but I hate drawing Superman because he’s so hard to draw. You have to actually know anatomy. [Laughs] But we all grew up on Batman. I think the reason Derek and I clicked is we’re about the same age, we grew up on the animated series from Paul Dini and Bruce Timm. CBR: Derek, does your work on all-ages comics like Adventure Time and Clarence require you to work differently than with other comics? Fridolfs: For the comics based on cartoons you have the best reference for it right there. You can go and look at the episodes and get a feel for what the creators of those characters are doing and then translate it to comics. Stuff like that I see as being very easy, especially if it’s a show you enjoy. Then you’ll get on other jobs where it’s a little more up to you to come up with a different angle to the character and it doesn’t have to fit into a specific guideline and that can be just as freeing as well. I like the ability to jump around and try different things. CBR: Dustin, you’re working on these books at the same time as Descender. How do you balance each project given their different approaches and styles? Nguyen: I have no life. [Laughs] I get up and I draw and then I sleep. I have less time now than I ever did before — because I have two kids — but I actually make more use of my time. When you know you don’t have a lot of time you sit down and you don’t zone out as much. I noticed this about people with very little time and I finally understand it. I used to watch Jim Lee draw at Wildstorm. Everyone thinks he’s slow and he doesn’t do much, but when he sits down for an hour he puts as much pencil to paper as I used to in like five hours. I would sit there and look up references and the next thing you know you’re on Amazon or eBay and you zone out. You feel like you have time, but you don’t really have time. Jim, because he has no time in his schedule, he sits down for an hour and he does pure work. I never understood that until I had no time. Now when I actually have time, I work. I think about what I’m going to draw before I sit down. I’ll go to bed thinking about the layout or if I’m painting I’ll thinking about which color to throw down first and then which next color to pour down so there’s less experimentation when I get to the actual process. I just learned to plan a little better now that I have less time because you have to get it done. I finally learned to understand myself. CBR: Was watching Jim Lee and others at Wildstorm important for you when you started out in terms of where you wanted your career to go? Nguyen: It should have been. I should have made more use of my time. Like when I watched Jim Lee draw I didn’t actually watch him draw, I just sat there and bugged him. Like, “Hey man, did you see The Simpsons last night?” I regret it. I should have watched him work more, but I just sat there and annoyed him. I always admired his work ethic. I would look at his final piece and try to figure out how he did it, but the smart way would have been to watch him do it, but I never did. I got my work ethic from Jim and also how much he loves comics. If you really like comics, comics will pay out. That’s what I saw in Jim. I was only there for about a year but yeah, being around Wildstorm was important. CBR: Dustin, you mentioned having kids, and I know one thing I talk about with people our age is how there aren’t many superhero comics you could give kids. Is that something you deal with? Nguyen: Working at DC for this long there is inside stuff you know about, but as far as them not putting out books for kids I would say that it’s kind of half and half. A lot of creators have to want books for kids. Li’l Gotham was something DC didn’t really care to do, but Derek and I pushed for it and we got it. DC knows what they want to do, but we can’t blame them for not putting things out because at the end of the day they’re a company that publishes books. Creators are the ones making them. There are books out there right now. Gotham Academy is a great book. You have to give them something you want do, and if they don’t want to do it then go do your book somewhere else. Fridolfs: I never thought of it that way, but that’s a good way to think about it. I’m a strong proponent of that. I work a lot in the all-ages market, but I always hope that a lot of these companies would expand and get into that area more. Maybe kids will just be getting into them a lot later than Dustin and I did growing up. I do wish that more companies would expand their market and do more kids books but Scholastic has their Graphix line of graphic novels for all-ages. BOOM! does a lot of kids books. There are places that do it, but it’s a shame that Marvel and DC don’t devote more time to doing it. They have stuff, but it’s just not as prevalent. CBR: This book isn’t a one-off title. You guys are working on more, right? Fridolfs: I’m working on the second book right now. I’m not sure how many they have planned but there will be at least two. Nguyen: I have cover layouts due tomorrow. We work far ahead on these books. If we have a lot of readers and people enjoy it, I can see us continuing to do it. Fridolfs: The second one will be out the same time next year.